Though the festive season is well and truly behind us, I couldn't help but bring attention to this fragrance to those who love a bit of Christmas all year round. I won't get too in depth about the brand as I'm sure most have heard about them by now but if you haven't please feel free to check out my Vanilla Ice Cream review for more info. 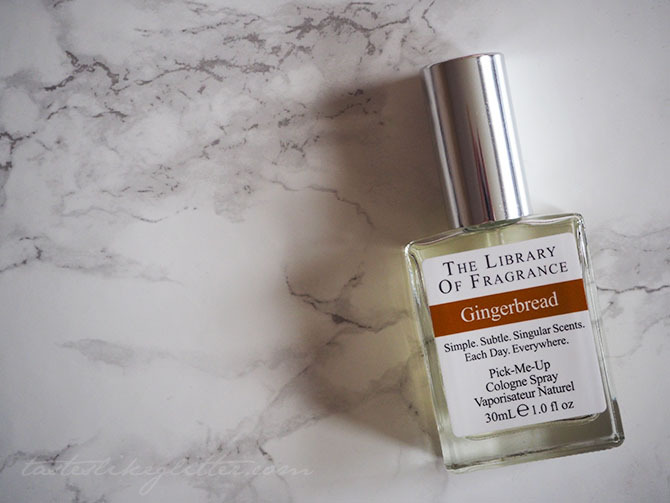 The Library Of Fragrance is a brand that hails from New York and trades under the name Demeter in the US. With a catalogue of more than 300 singular scents, there is sure to be something that's just perfect for you. Out of all the fragrances I purchased from them, this soon became my absolute favourite. When you first spray it you're hit with an immediate warmness, like freshly baked gingerbread cookies. After a while it develops into a rich fragrance with subtle spices. What I love about this is the warmth of the scent. It makes it so deliciously comforting and reminds me of festivities all year round. Though the fragrances don't have different notes like other fragrances, I think that's what makes them different. It's smells exactly like it's supposed to. Nothing more, nothing less. If you're looking for a sweet, warming fragrance that evokes holiday memories I definitely recommend giving this a spritz.